The Sign Chef, an on-line custom sign company based in Charleston, S.C., boasts more than 170,000 worldwide clients including retail stores, corporations, professional offices, universities and hospitals. But creating signs for the U.S. Armed Forces – including 70-plus U.S. military installations across the country and several international locations – serves as a special source of pride for Justin Myers, chief operations officer, The Sign Chef, who is a disabled U.S. Navy veteran and Wounded Warrior Project alumni. “My goal is to produce signs for every single U.S. military installation on the planet; the military is so close to my life,” said Myers, who not only counts his father and grandparents as military veterans but can trace family members back to the Continental Marine Corps. “I planned to serve in the military for 30 years; but, my body just broke down,” said Myers. 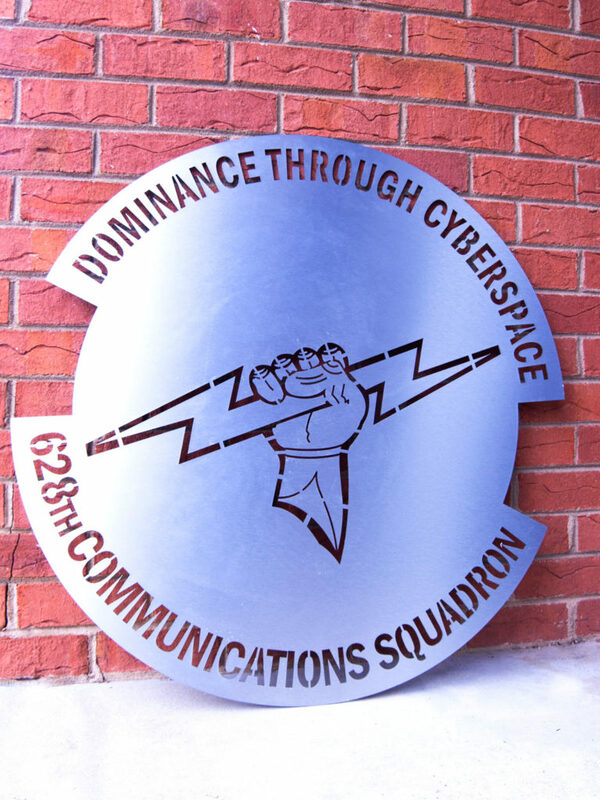 Most recently, The Sign Chef produced seven signs for the 628th Communications Squadron of the U.S. Air Force at the Joint Base Charleston on 3mm Dibond® aluminum composite material (ACM) by 3A Composites USA in the Brushed Silver finish. 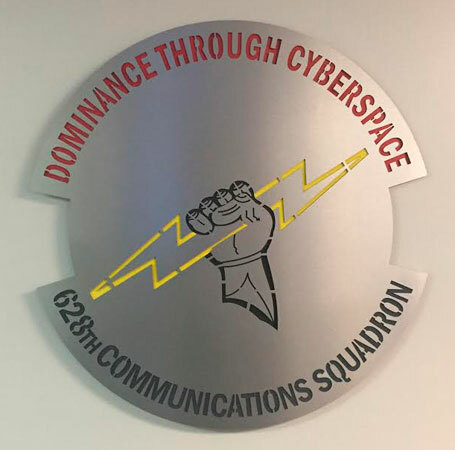 The shield-like signs were reverse cut with a CNC router and feature a cutout lightning-bolt logo and “Dominance through Cyberspace” slogan. Some signs were backed with a combination of red and yellow Acrylite acrylic to emphasize cutouts. So, when Myers decided to create a wall display last year for installation in The Sign Chef’s lobby to honor military veterans, nothing but high-quality Dibond would do as a substrate. While Myers acknowledges the sacrifices that he and other wounded veterans have made in service of their country, he wanted The Sign Chef display especially to memorialize those military men and women who have made the ultimate sacrifice. Nikki Newsome, lead graphic designer at The Sign Chef, worked with Myers to create the 8-by-10 foot wall display. Dibond Brushed Silver in the 3mm thickness was selected to create a 15-inch by 84-inch header featuring eight stars and a dedication reading: “In Honor of Our Military.” The header was reverse cut with a CNC router and backed with red Acrylite acrylic to emphasize the cutouts. The Dibond header was finished with Trim USA glossy black plastic edge capping. The remainder of the 48-inch by 96-inch Dibond Brushed Silver sheet was used to route five circular medallions representing the five branches of the U.S. Armed Forces. 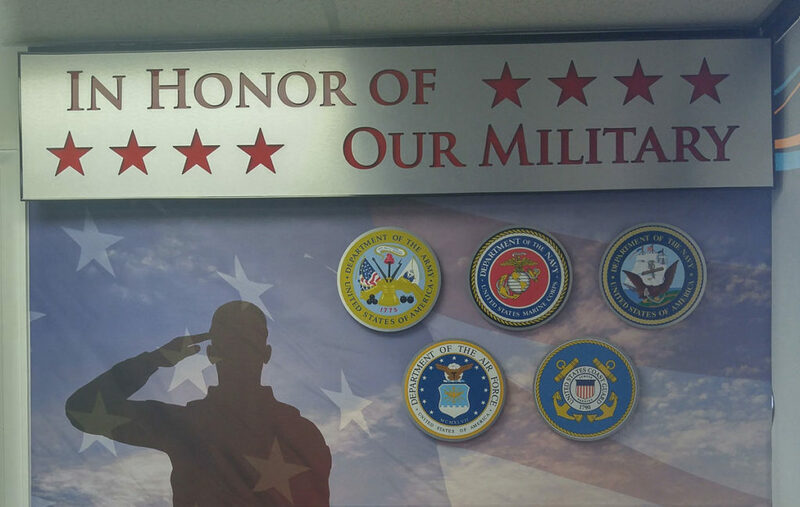 Seals of the Air Force, Army, Coast Guard, Marine Corps and Navy were printed on Avery self-adhesive vinyl with a Seiko ColorPainter M-64 wide-format printer and adhered to the medallions, which featured unfinished edges to display Dibond’s solid composite core. The header and medallions were installed over an 8-foot by 10-foot backdrop featuring the image of a soldier saluting a waving flag that appears translucent against a cloud-filled sky. 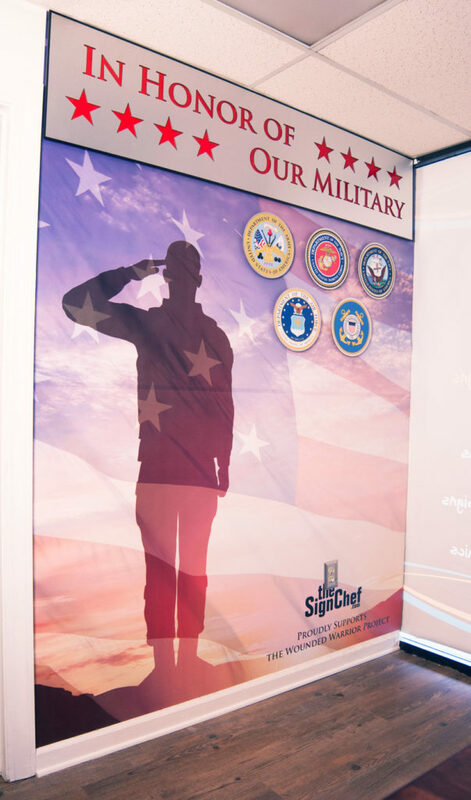 Additionally, the backdrop features a statement recognizing The Sign Chef’s on-going support of the Wounded Warrior Project. The backdrop was printed with the Seiko ColorPainter M-64 on removable wallpaper designed for print applications. The Dibond header and medallions were blind stud-mounted to the drywall. The military wall display was installed in The Sign Chef lobby in February 2016 and has continued to receive regular compliments from customers, according to Myers. “We hear customer comments about the display every single day,” he said. Additionally, the display has been appreciated internally by employees of The Sign Chef, according to Myers. While memorializing lost members of the U.S. Armed Forces, the display also serves as a tribute to the many veterans employed by The Sign Chef, he said.